The snow is in some kind of sad shape! My skiing has been limited to weekend patrol duties with a few powder days thrown in here and there. It kind of makes work a bit boring. However, as far as ski patrol goes, it's been a fun first season. The Park City ski patrol is very impressive. It's amazing that the weekend patrol (40 per day), volunteer their time and energy to make up such a professional and effective team. Some of the PCMR vols have been active for 20+ years! Says a lot about the program. A pre-sweeps meeting. (at the end of the day, ski patrol "sweeps" the mountain making sure all the guests are down and safe). Summit dispatch - the brains of the mountain. All of these guys have been vols for multiple decades. The Amstel Light dogs were at the Legacy Plaza one evening last week. After working half a day, this beautiful weather was just to great a temptation. I headed for the Point Of the Mountain around 1:00pm and arrived shortly after on the southside. I was late! Earlier a hand full of hangs and bags cashed in on the mornings smooth air. In dwindling conditions, I set up hoping I would get a few crumbs. No dice. The south totally died off, and the north winds began to trickle over the backside. 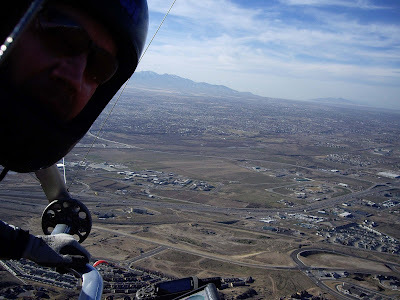 A few pilots from Montana and North Carolina, eager for airtime inspired me to pack up and head to the north side. It payed off. As we set up, a few bags launched and benched up. It didn't take long for us to finish setting up and launch. Great temps, great air, awesome day! When I look back on the past few months, I must say its been a blur. Among other things, this winter one of my primary goals has been preparing for volunteer Ski Patrol at Park City Mountain Resort. PCMR is one of the few Ski resorts that use volunteer Ski patrolers on weekends. The process to become a patroler is fairly intense. Last year toward the end of the ski season, PCMR patrol ski tested a dozen or so candidates. Those who passed the test were eligible to enroll in the Outdoor Emergency Care (OEC) course sponsored by PCMR. The OEC course started October and ran for six weeks. The OEC is equivalent to an EMT 1, and passing required an 80% on the final. The on hill training began soon after the OEC course was over, and it wasn't until mid February when most of the group was rostered as rookie patrollers. One of the most time consuming aspects of our training has been toboggan handling. 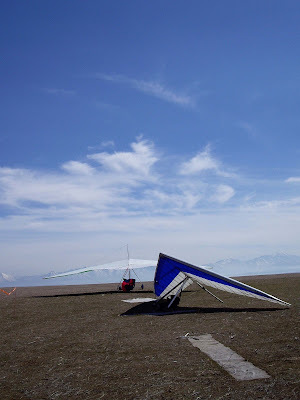 Essentially, you learn to handle several types of toboggans on easy runs as well as most difficult terrain. Sometimes the steepness of the slope requires a tailroper. 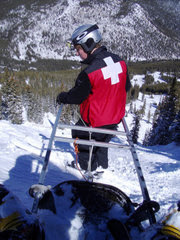 An additional patroler acts as a brake person, utillazing a rope attached to the rear of the toboggan. 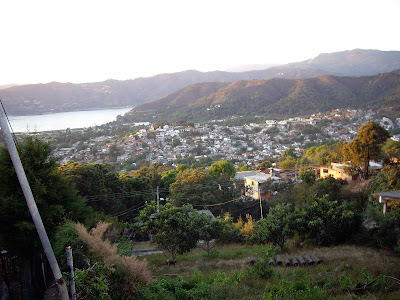 There are so many Valle De Bravo pics. 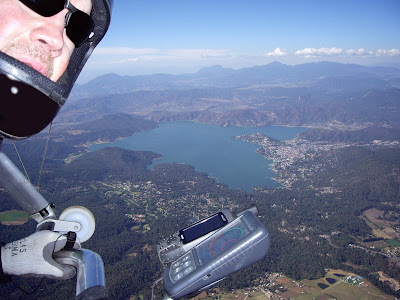 I believe between Cody, Greg and I we took over 250 pictures while in Valle De Bravo. So for the next few blogs I may be posting a few here and there. This shot was taken by yours truley, toward the end of a two and one half hour flight. 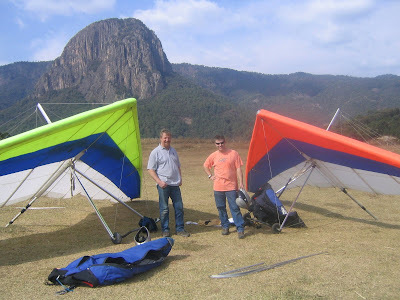 One of the great parts obout flying in Valle is the incredible diversity of landscape in a relatively small area. Even though most of our flights were under tweny miles, the flights felt longer because of the diversity. Cody getting agro with a thermal high above Valle. 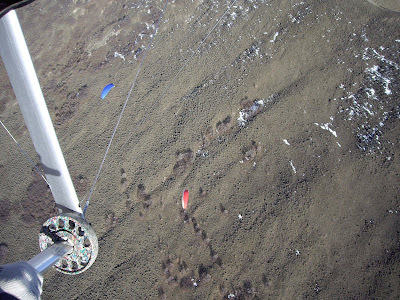 Greg and Cody after landing below launch in the Piano LZ. The rock formation in the background is called El Pinon. El Pinon, if you can imagine, is a great thermal generator, roudy at times but typicaly dependable. Our condo was great, with several balconys overlooking the boardwalk along the lake. 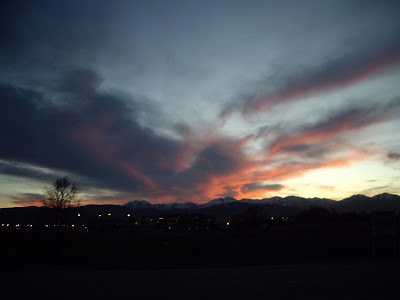 This pic was taken on an evening walk.